I've found random books in random places before, and I know that people leaving reading material behind for others to take is nothing new. But that's kind of the point. Libraries (or reasonable facsimiles thereof) just seem to organically generate themselves wherever there are people. 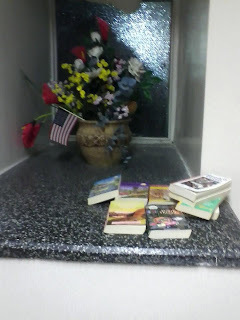 For some reason, it was a comforting thing for me to think that the person who put them there thought "These are books. These are special. Someone else will want these." It's a true case of one man's garbage being another man's treasure. Try THAT with e-books! Happy holidays, everyone, and merry reading. 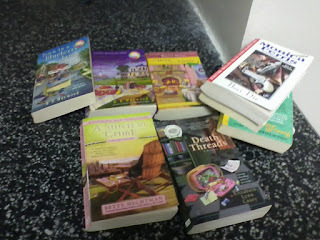 A whole stack of cozy mysteries!? How awesome! I totally would have snatched them up. I love cozies. :) I hope someone took them who will enjoy them! That is an oddly patriotic flower arrangement! :) And yay for pop-up libraries! My favorite 'abandoned book collections' are the ones that make it clear that someone has just made a life choice--given up acting, sent a child to school, gone Republican, etc...Park Slope is particularly fertile ground for those renouncing their careers in the theatre. I LOVE flash libraries... I cleaned out my desk a few weeks ago and found a paperback I'd brought to work and forgot to take home. I left it in the office pantry. Today, there is a stack of books on top of the microwave. Take one/leave one. Great way to share the fun. Sounds like a crafty person left those....I think I have read some of those Needlecraft mysteries! aw! that is lovely! I have thought of leaving books on trains sometimes when I finish them, but am afraid someone would just chuck them out. One of my friends once told me about some 'train book' society where you leave books on trains with some sticker and people read them and leave them on another train and there is a website where you can check them in and see where they have been. I don't know if it's real or how to find it. My boyfriend's mum and I swap books all the time! Laura, there IS a website like that, but I forget what it is. I'll try to find it! A cosy mystery fairy - cool. There's a little breakfast and lunch restaurant across from where my parent's live in Kent, Washington that has a couple of book shelves for "take a book, leave a book." If I'm ever in charge of a small business, I'll set up a place like that. @Laura and Rita - bookcrossings is the website for "releasing books into the wild."